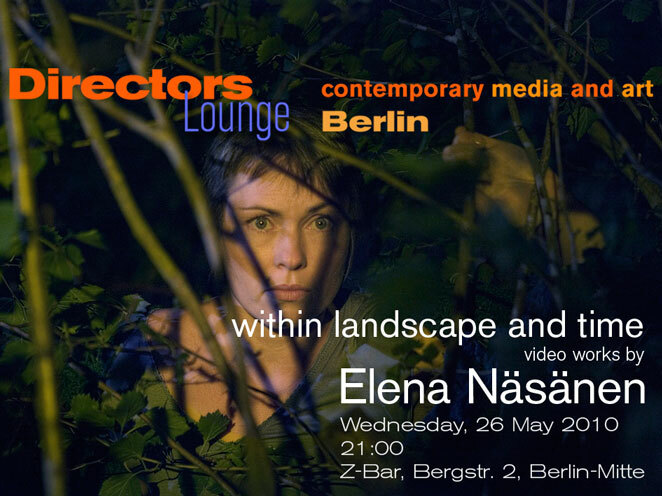 Elena Näsänen’s reference for her work on video is the big screen, the glory of grand cinema, and with that, the picture of nature in cinemascope. She is one of the few artists who work exclusively on video, and who are rarely shown on a cinema screen. Instead, the audience finds her work in art shows, galleries and international exhibitions. The films of the Finnish artist who lives in Helsinki contain structures of narrative cinema: most of them are written by the artist, are played by actors, and they are building up a suspense of uncanny possible occurrences, which the audience anticipates to happen. In “Before Rain” Elena uses fragments of Hollywood crime movies that stay unresolved, in “Night” a female character follows an urge to leave the house at night searching through the adjunct woods, and in “Wasteland” a group of women are on their way to an unknown task and destiny. There are two other elements, however, that seem to mark Elena’s work just as strongly: time and nature. Time is strictly connected with images. If her images stay in our memory, their time seems to persist, thus making time ambivalent, a “film time” that stands still or becomes endless, depending on the viewer. Nature, on the other hand seems to dominate the image, and Elena’s characters. Maybe, Elena Näsänen here revives a contemporary view onto the sublime other: Nature as it has become the unfamiliar other for us city dwellers. And this mystery may be contained by the Australian outback, the Chinese yellow mountains, or the Finnish landscape.